Explore the unique volcanic and arctic nature of Iceland. 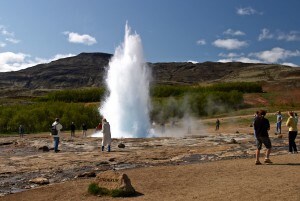 In one afternoon, this popular excursion enables travelers to visit some of Iceland’s most famous sites. We visit Þingvellir National Park (English: Thingvellir), where the Icelandic parliament Alþingi was established in the year 930 AD. In 2004 Thingvellir National Park was added to the UNESCO World Heritage List and is now one of eight hundred places in the world that have been honoured by UNESCO. From there we continue to Gullfoss waterfall and the spouting hot spring area around Geysir and Strokkur. Although this trip is an express tour, you will be visiting some of the very best known historical sites and natural phenomena in the country. Daily pickup at 12:30 - 13:00.